These audios are part of the "Think Birth to Legacy"
"The Coach-able Coach" Training Series. 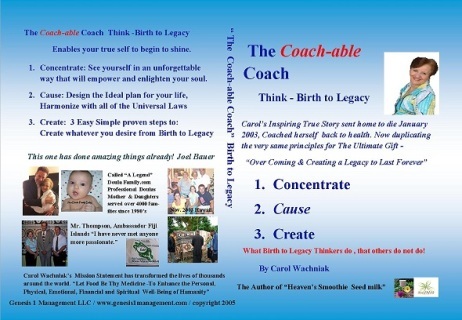 The Coach-able Coach "Think-Birth to Legacy"
Carol has been called a "Legend" along side these wonderful people Who lived, Loved and Made a Difference. 2. the body of customs, beliefs, stories, and sayings associated with a people,events, thing, or place. Leaders of integrity in the Birth and Well-being Family Movement that impacted and empowered women and men to be self reliant, to be the director, and creator of their birth experience. To become informed consumers and ultimately they hold the responsibility for the well-being of their families. but the legacy, golden nuggets of wisdom is still in their message and it is still important today. The was one of our foremost leaders in informed Home Birth. Expert in his field, author of "Emergency Childbirth" trained hundreds touched the lives of thousands around the world. Dr. White was the leading Medical Adviser for - Le Leche League International providing breastfeeding support and education globally. With a proper diet Dr. Brewer believed and knew that Toxemia was completely preventable. Author of "Husband Coached Childbirth" 1957 Starting in 1947 Dr. Bradley introduced holistic childbirth, prenatal Education, good nutrition, physical,emotional, and spiritual support. The concepts of husbands in the delivery rooms, birthing rooms, photography during birth, are now implemented across the U.S. He was the Co-Founder and President what is known as the Bradley Method of Childbirth. * Camille Wade Maurice MSW, ACSW: Comedy "Stress and the health care provider"
*Clara Hale of the Hale House leaders in working with drug addicted babies and their mothers. President Reagan recognized her as a contemporary folk hero. Founder of La Leche League International, the foremost authority on breastfeeding science and awareness since 1956.